1. How does Mr. Wheelchair Riding Architect get in my house with steps?!? Think these two pictures don't compute? Actually, Nothing's impossible. He won't win any races, but Erick can walk with a cane, and if you've for a handrail, he can handle stairs. We recently finished a 6-story building that he went up and down each week for construction meetings. His wheelchair is a super-light titanium speedster, and the only caveat is that he would need you to roll it up and down the stairs. Where there's a will, there's a way...and as long as there's architecture to be done, he'll be there! 2. 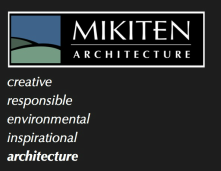 How big is the Mikiten Architecture office? We like to stay lean so that Erick can be invested in every project. We have a great network of former employees and outside consultants we use as needed so that we can produce every project on time, but our office staff varies between four and seven.